Home » » Batmobile: The Complete History - A New Book! In addition to comic books, the Batmobile has been immortalized in nearly every imaginable medium, including film, television, toys, and video games. Most recently, it was given breathtaking new life—and incredible capabilities—in Christopher Nolan’s extraordinary film trilogy, which concludes with 2012’s The Dark Knight Rises. 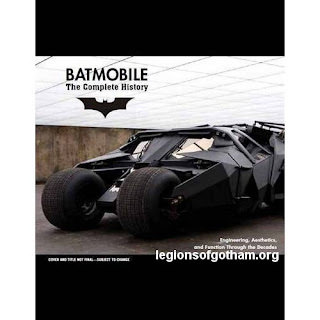 While each of the Batmobile’s incarnations will be explored, special attention will be paid to the "Tumbler" Batmobile from Batman Begins, The Dark Knight, and The Dark Knight Rises. With stunning gatefolds and detailed specs, blueprints, and historical comparisons, BATMOBILE: The Complete History is an informational and visual delight for auto and Batman fans alike. It’s an unparalleled and high-speed journey that will leave you breathless.